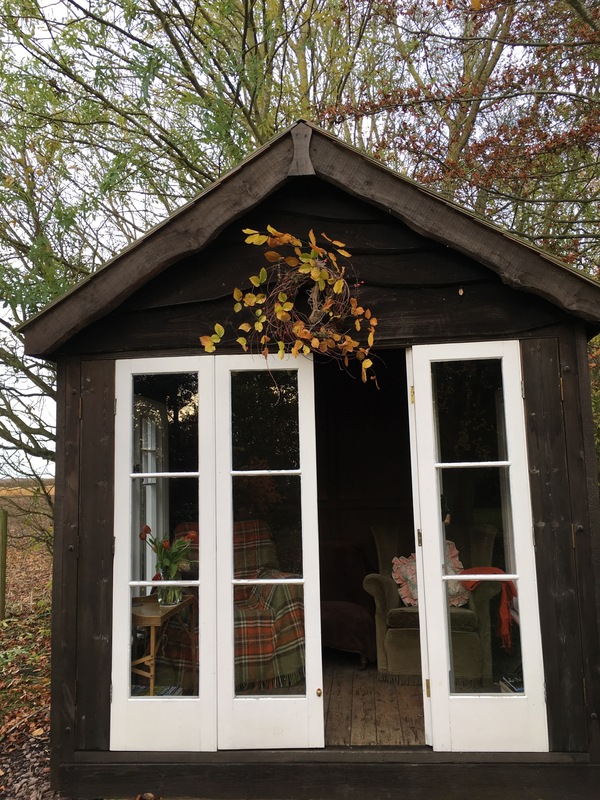 Still mild enough to sit in the summerhouse. Heaps of cosy woollen blankets to hide under. 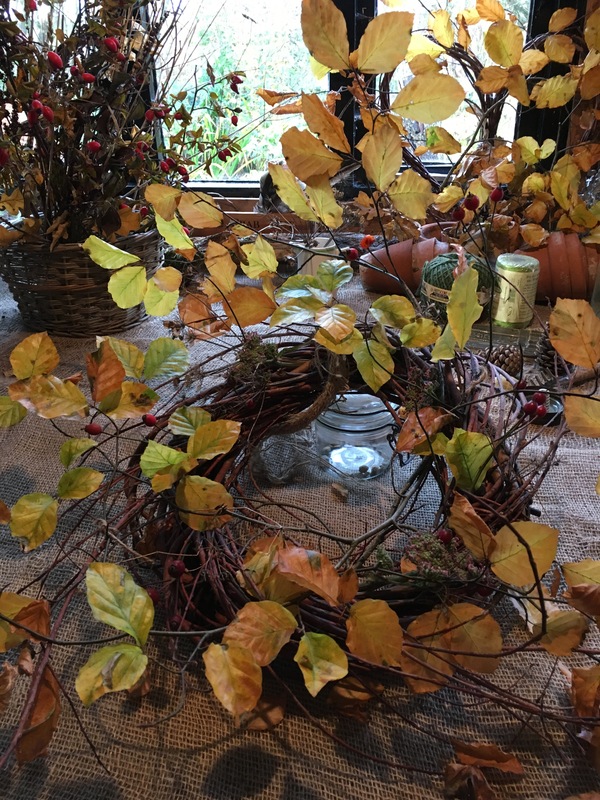 So I made an autumn wreath out of beech leaves, rosehips and cowparsley seed heads. My wreath is made from a woven willow base. I learned how to make them from Georgie Newbery at Common Farm Flowers. I can highly recommend the courses. I attended one for creating a cut flower patch and posy tying. I’ve never had to buy any flowers for my house and family since. I’m planning to attend one next year on growing flowers for weddings and special occasions. I’ve already bought my voucher for the course. It’s great to have something to look forward to as winter starts to bite. 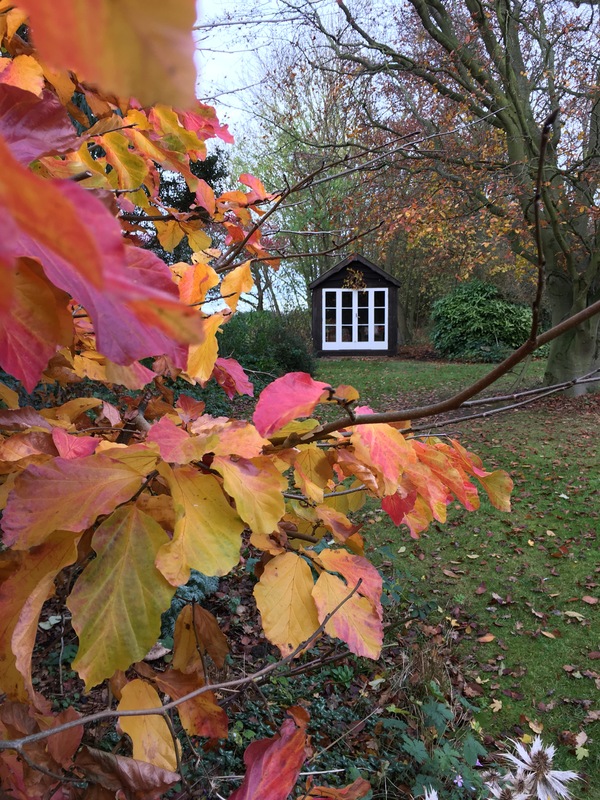 The Persian ironwood shrub, Parrotia Persica still looks like a bonfire of colour. 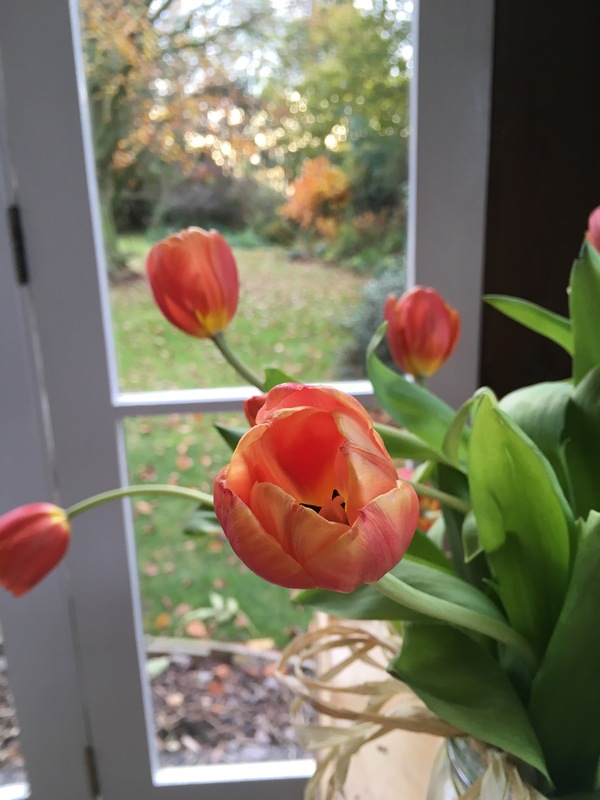 Orange tulips, a present from a friend- the view inside the summerhouse today. Have you got a favourite place you like to sit in the garden? I love the wreath. I love to sit on a bright pink garden chair. The colour makes me feel good! Beautiful photos. Love the wreath. Looks like a very calm and relaxing space. It’s beautiful! Where do you live? Love the wreath. Beautiful photos. Looks like a lovely space, so calm and peaceful. The Parrotia is still wonderful. It was a few weeks ago that you featured it. The wreath is a lovely idea, I should make an autumn one as I’m usually away for Christmas unfortunately. I like yo sit on the terrace looking west and enjoying the last rays of the sun. The wisteria is still shading the rest of the terrace so that’s not so welcoming at present. What a beautiful spot you have and those are great photos. Loved visiting your little summer house. Thanks for sharing. Ah, yes. I’ve done the driving the children about bit. Now they drive me! Georgia’s courses are worth every penny. She’s an excellent teacher. I always thought I needed a huge space to grow cut flowers. Georgie taught me to grow less- but grow it well. That way I can take good care of the few plants -and have maximum flowers. It really works. And I sell surplus flowers on the village green for children’s charities. So funny, because villagers will now ring me up when the flower basket is empty. And a kind lady takes the honesty tin in over night for me. Cosy and pretty. The beech wreath looks great, ethereal and wonderful colours. The wreath making’s rather a nice idea. I have a little pergola with clematis climbing the sides but it’s much too cold once the sun dips at this time of year. Oh yes, definitely. Live and learn hey. Your wreath is lovely. 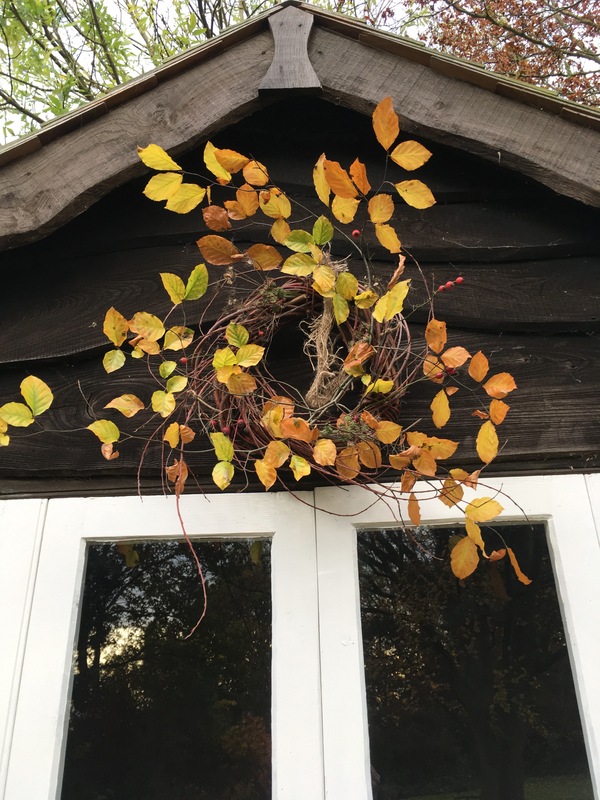 I have yet to take down the hop vine from which I usually make a wreath – the forecast is sunny for a few days so I might get it done yet! You’ve inspired me.